You open the newspaper, you turn on the evening news, you watch the Sunday talking heads and the story is the same, Jews on the front lines protesting against the elections of President Trump. They are there carrying the “Not My President” and the “Not Our President” signs, the front lines against the seven nation hold on refugees and immigrants until a proper vetting program can be initiated, and the lead in every protest on every campus and in every city. These are Open Orthodox, Conservatives, Reform and Reconstructionist Jews as well as the few Hassidic Jews who firmly believe that Israel should not have been founded until the Messiah has come and established it for the Jews. All of these Jews have one thing in common, they are in stark contrast to the vast majority of Israeli Jews and their fellow Jews in Israel stand confused and somewhat shocked. How do I know this? Because that is the number one question I hear every morning at services. My fellow congregants ask me to explain what these Jews are so upset over and why are they fighting against everything which Israelis believe has been the greatest thing to come along for Israel since Truman recognized Israel in 1948 and the military cooperation between our two nations over the past sixty plus years now, since the Six Day War woke Lyndon Banes Johnson to the fact that Israel just might serve as a good ally for the United States. Their confusion is palpable and can only leave me sad when I finally tell them the truths. The reality is best made for them to visualize when I explain that the Conservative Synagogue my wife and I attended, for lack of an Orthodox one available where we resided in Oklahoma, was all but exactly identical in atmosphere and service style to the Reform Synagogue I had attended at times during my teen years. Even more troubling for them and my telling is that the number one question we received when congregants learned we were making Aliyah and moving to Israel was, “Why would you want to go there?” and “What is wrong with you?” and lastly a simple, “Why?” as if we would fully understand that last single word expression of disbelief. This was the standard set of queries with the exception of the few real friends we had made who were fellow conservatives politically. These friends had already requested we keep their political aligning with the Republicans to ourselves as everybody knew my wife and I were Republicans and very conservative politically as we broadcast it not being worried about making friends. What did turn out to be interesting was that after a while the very liberal Rabbi had to reconcile that he and I have some similar ideas on Torah and human rights, something he found astonishing. At least the Rabbi was happy about our moving to Israel hopefully because he at least also loved Israel and not because we were leaving, we believe it to be the former. I explain to my Israeli friends that the vast majority of Jews have little if any affinity for Israel and simply wish Israel would give the Palestinians whatever it is that will make them happy, a state, whatever, just satisfy them at any cost so that Israel stops being an embarrassment for them. Their liberal, actually leftist in all too many cases, was far more important to them than was the survival of Israel or the lives of Israelis. They lost their affections for Israel decades ago once Israel pulled out their victory in the October 1973 Yom Kippur War after being caught completely off guard and flat-footed. The fact that Israel was able to repulse the attacks in that war gave the American Jewish community the feeling that Israel had become a superpower all but equal to the United States and impervious to Arab aggressions. Many younger American Jews even believe that Israel is probably four, five, six or even ten times its actual size as they believe it remains the size it had when it still held the Sinai Peninsula. These younger Jews are really geography-challenged and have little if any actual clue of reality and if they were to be told that Israel is barely the size of New Jersey they would be more likely to believe New Jersey had grown to the size of Texas than change their unfounded views about Israel. As far as many American Jews are concerned their leftist values are far more important than any Jewish homeland as for them America is the new Promised Land. This article may receive a number of denunciations because these Jews are also very sensitive when called out as they are the good people and are always beyond reproach. Their beliefs are always above question and of the highest morality. Their belief is Judaism is all about what they call Tikkun Olam. This they define as repair the world through converting the world to their socialist perfect world where the government solves every problem. They do not see Tikkun Olam as the perfecting and improvement of the self in order to make the world better. They see themselves as already as near to perfect as is humanly possible and the real problem is making everybody else to be like them. If everybody would simply believe as they do, the world would become a perfect world. To them when they see Israel in the news it distresses them not because they feel for Israel but because the problems Israel has reflects on them making their lives difficult as they feel they are identified with guilt rubbing off from Israeli misdeeds. They perceive Israeli actions defending herself from terrorism to be unnecessary as if Israel would just bend to the Arab demands then there would be peace. Their desire is for all problems to go away the fastest and easiest means possible, and that to them most often is Israel compromising because their leftist newspapers and newscasts all blame Israel so it must be true. They also see the government headed by Prime Minister Bibi Netanyahu to be exactly as their news media portray it, an extreme right wing settler crazies who refuse to give the Palestinians their rightful homeland. 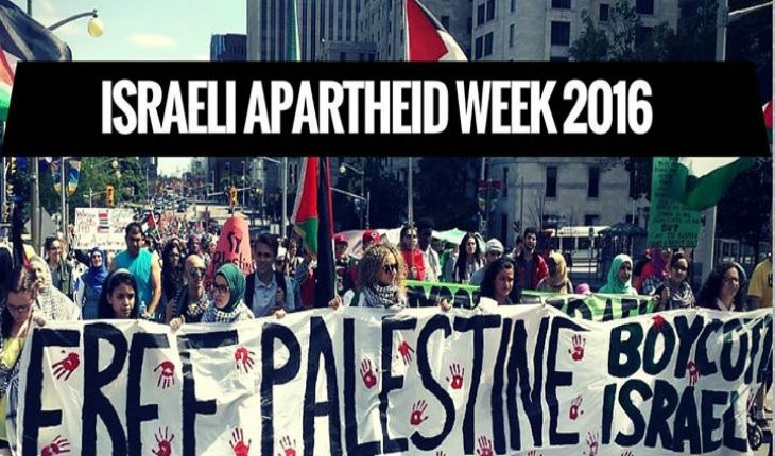 They believe that Israel conquered Palestine in 1967 and some even believe that Israel was a European colonialist enterprise from before 1948 and that there are no non-European Jews in Israel. There is no way to convince them of the reality that approximately half of Israeli Jews are from Arab nations of MENA (Middle East and North Africa) as well as India, Ethiopia and other places where lost tribes of Jews have been rescued. They believe that Israel is an Apartheid nation which denies Arabs the right to vote, work in certain fields, and refuse to allow Arabs free access without facing checkpoints at every intersection, well, not every intersection but too many. They look at you like you are trying to tell them Martians live in Israel when you tell them the Arab Israelis have every right that the Jewish Israelis have and that Israel has one of the largest Baha’I populations in the world as well as Druze and Bedouins who also have full rights and vote in Israeli elections are doctors, nurses, teachers, and in the Knesset, the Israeli Parliament. Speaking the truth to these Jews and expecting them to accept a single word is like speaking to a brick wall and expecting it to move out of your way. These Jews are more likely to believe the lies peddled by CAIR than they are to believe us when we visit from Israel with wonderful stories about how warm and wonderful life in Israel actually is and how we love living here, but they believed we were a bit odd to begin with. The reality that Israelis need to learn to accept is that outside the true Orthodox Jewish communities, the Jews in America place the Democrat Party ahead of Israel in all things. The American Jews will accept that Keith Ellison is a perfect choice for the leadership of the Democrat Party and will see him as posing no threat to their existence. Should somebody point out that Keith Ellison supports Louis Farrakhan and his views that Jews are evil people who are barely human and deserve to be refused rights and that many of those who follow Farrakhan’s Nation of Islam actually desire to murder every Jew in America and some even the world they would call them a liar and demand their ostracization from membership in any social or political group potentially even the Synagogue except that would make them appear hateful. The fact that their beliefs about Israel easily make them appear to be hateful though they could not possibly be such as they are the perfect and beautiful people who are so full of love and compassion without a hateful bone in their bodies, ask them, they will gladly inform you and each will attest for the others. Theirs is a wonderfully close-knit community which supports all the correct causes and is by far the most acceptive people who support gay marriage, the entire LGBQT set of causes, the acceptance of refugees from Syria, Libya, Somalia, Afghanistan, Sudan and everywhere else across the Islamic World as it is in turmoil and believe that people should have the right to use whichever bathroom suits their mood each day and that gender-free bathrooms are a necessity and President Obama was the most Constitutional and perfect President greater than Lincoln, Washington and Jefferson combined, especially those detestable slave owners Washington and Jefferson. Inform them that Saudi Arabia, the Gulf States, Iran, Egypt and the remainder of the Arab world have not appropriated a single refugee while the few nations which have had their borders crossed by refugees have corralled these refugees into camps surrounded by razor wire and armed guards with the expectations that these refugees will either be returned to their nation of origin or allowed to emigrate to Europe or elsewhere in the developed world but never a single one allowed to be taken in by another Arab nation, this they would be aghast and in complete disbelief. They would essentially murder the messenger rather than check to authenticate the message because it transgresses their firm belief that the Islamic world is above reproach and the people who might support President Trump’s temporary, that is temporary, holding of refugees and immigrants from seven unstable and terror hotbed nations with failed governments until a method for proper vetting can be put in place are uneducated simpletons. Such news would upset their world and as such it must be false because they have such a great grasp of everything which is passing along the world each day that such news which goes so completely against their world view thus impossible. Still, why is it that none of the Arab nations such as Saudi Arabia have taken in even a single refugee from Syria and the other six nations which are on President Trump’s travel restrictions and the United States should simply open the doors wide with no restrictions? These are not the tired, the poor, the huddled masses but the victims of dysfunctional states which have been all but destroyed who may be infiltrated by unknown numbers of Islamic State terrorists, al-Qaeda terrorists, Muslim Brotherhood operatives, and unknown other terror suspects which vetting could detect. Perhaps Trump should make a deal that once the one hundred thousand airconditioned tents Saudi Arabia had set up in the dessert for the Haj and used them for Arab refugees then the United States will start taking the overflow afterwards (see image below). The American Jews probably find the news about all those tents with air conditioning which Saudi Arabia could use for refugees something they have been unaware existed, but that would not be any reason nor would the rejection of these same refugees by Saudi Arabia should not affect the United States policies on these same refugees. One must wonder why the Saudi Arabia Royal Family is so against taking in these refugees, so strange. 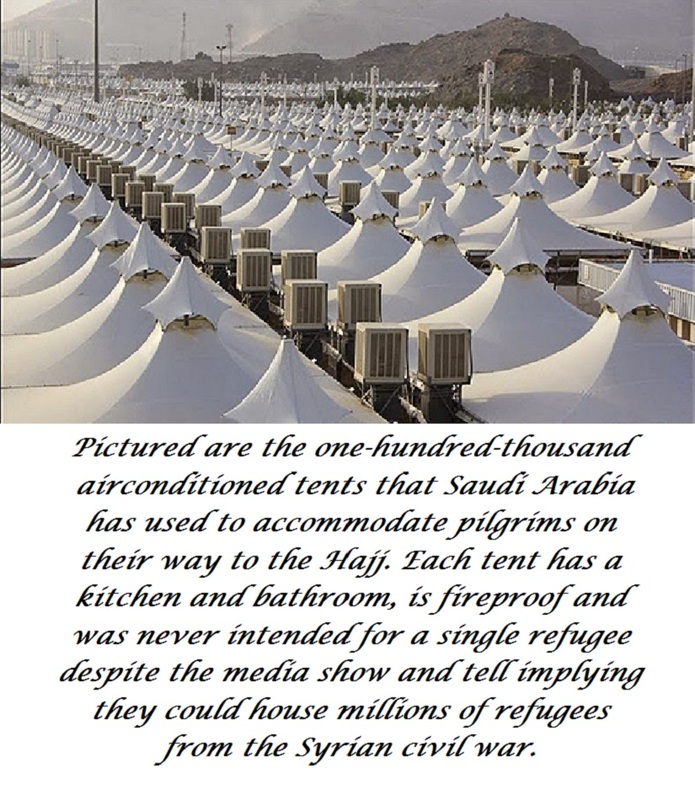 There exists one hundred thousand really large tents Saudi Arabia uses to accommodate pilgrims on Hajj and each has a kitchen, bathroom, fire wood stove, as well as an air-conditioner and they never were intended for refugees as they are far too nice, or at least that is the Saudi Royal Family’s view.